A new poll of Star Wars fans concludes that Jar Jar Binks is not the most hated character in the universe. In a surprising turn of events, the new poll points out that Jar Jar is 5% more popular than Kylo Ren. 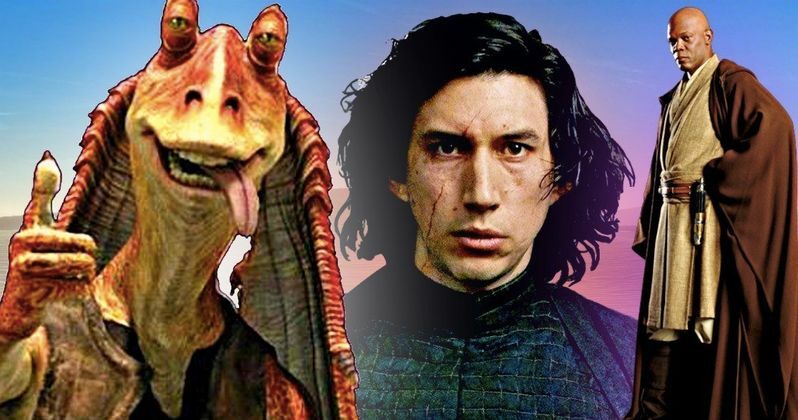 Many have given Adam Driver's portrayal of Kylo Ren the thumbs down, some have even taken to calling him "Darth Millennial," but Jar Jar Binks has been universally hated for nearly 20 years now, even by the actor who gifted us with that annoying voice. The proof is all right there in the numbers and as they say, "numbers don't lie," unless they were counted in Florida, but that's another story. Morning Consult asked 2,200 adults for their impression on various Star Wars characters. Leia Organa unsurprisingly topped the list with a 73% favorability rating, followed by Luke Skywalker, Chewbacca, Yoda (72%), and R2-D2 at (71%). The first villain is technically Anakin Skywalker (55%), followed by Darth Vader (49%). While the first character from the new trilogy is Finn (39%), the rest starts to get weirder and more cynical. As it stands, Rey (38%) is only one freaking point above Jar Jar Binks (37%). Daisy Ridley's portrayal of Rey is on some really thin ice according to the latest poll, but Kylo Ren, Mace Windu, Emperor Palpatine, Jyn Erso, Count Doku, and Supreme Leader Snoke have all fallen through the ice and into the icy waters of Star Wars criticism. One has to imagine where the Porgs will fall in this list after the release of The Last Jedi next week and also wonder why they left the Ewoks off of their list. Is Kylo Ren really worse than Jar Jar Binks? That's the real question. Adam Driver and J.J. Abrams have taken quite a bit of flak for Kylo Ren since he was introduced in 2015's The Force Awakens. Many have cited that the mask came off too quickly for Kylo and that he should have kept it on to avoid becoming a meme for his hilarious tantrums where he throws his helmet like a 4-year old. Some have straight up called him "Hayden Christensen reborn," which may be even worse than being less popular than Jar Jar Binks. However, others have praised Adam Driver's performance and call it one of the best parts of The Force Awakens. We may never know the real reason that Kylo Ren is hated more than Jar Jar Binks, but this is a mystery worthy of investigation. The Last Jedi is now one week away as of this writing, so it might be time to conduct another poll in the near future to see where the Star Wars characters end up after the latest installment. Unofficially, the Porgs have become one of the most divisive characters to pop up in the Star Wars universe, with some comparing them to the mighty Jar Jar Binks, who is now officially not the most-hated character any longer. Go check out Morning Consult to see the numbers for yourself and see if you agree or disagree with the rankings.